Should Democrats present themselves as fighters for a transformative economic vision, or as skilled managers whose job is to restore and maintain the status quo of the last several decades? The question came up again last week, when new economic data for 2015 was released. It’s all true, and it’s a welcome burst of unexpected good news. These are major advances by any standard. But there are lingering problems. Median household income is still lower than it was in 2007. In fact, it’s lower than it was 20 years ago. Moreover, as the Economic Policy Institute’s Elise Gould points out, most of the income growth occurred at the top. 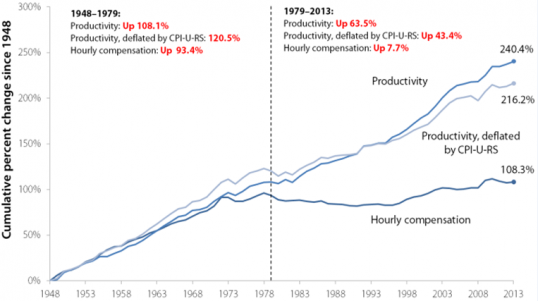 Wage inequality continued to rise last year. Many parts of the country are still wrestling with extreme poverty and lagging incomes. Americans pay more today for needs like health care and higher education than they did in the 1990s. At 14.5 percent, our poverty rate is still higher than the latest reported figures for most Western European countries. (Only austerity-battered Greece and Spain fare worse.) States like Mississippi (with a 22 percent poverty rate) and Arkansas (at 19.1 percent) are much worse off than any developed nation. And, as Shawn Fremstad points out, the federal poverty measurement undercounts America’s poor. Obama’s comments will probably play well in states like Connecticut, New Jersey, Maryland, Massachusetts and California – all in the top 10 for key economic indicators. But they won’t resonate in the struggling states that are more inclined to vote for Donald Trump. Economist Dale Jorgenson told The New Yorker that “we’re almost out” of the Great Recession. Perhaps that’s true, at long last. But that will not give Americans back their years of lost income. It won’t make college or health care affordable, or give them the childcare benefits and paid leave enjoyed by citizens of other Western nations. It will not heal our struggling rural areas or rebuild our devastated inner cities. There are positive indicators in Gallup’s data, but there are also warning signs. 30 percent of Americans see the economy as “poor.” Americans’ satisfaction with the way the healthcare system works for them has fallen slightly since 2014. While some of that discontent is clearly political – in this case, Fox News probably is a factor – some is presumably the result of skyrocketing out-of-pocket costs for the millions of Americans who receive coverage through their employers. And there has been a steep drop in the number of people under 45 who say they are in excellent health. These voters have reason to be unhappy, and they appear increasingly inclined to act on their unhappiness. Economist David Autor and his co-authors found that voters whose communities had lost jobs to China tended to replace moderate Republicans with hard-right extremists. Districts represented by centrist Democrats either replaced them with more liberal Democrats or switched to conservative Republicans. It would appear that politicians from the pro-trade-deal “center” were largely rejected. In itself, that’s not an irrational response. Unfortunately, the right-wing alternative is worse – much worse. But how can Democrats convince struggling voters that they understand their needs while at the same time celebrating an economy that has left these voters behind? That job got even harder last week when the president teamed up with Ohio Gov. John Kasich and other Republicans to push another job-killing trade deal, the Trans-Pacific Partnership or TPP. Last week Hillary Clinton said, “I want to give Americans something to vote for, not just against.” That’s smart politics. But there is a fundamental disconnect between that message and the president’s “Thanks, Obama” remarks, which essentially told Americans their lives have already gotten better. Granted, there’s a delicate balance between celebrating your party’s accomplishments and channeling voters’ pain. But if Clinton and her party want to offer a positive vision for the future, they’ll need to do more than promise to restore a pre-recession economy in which lower-income and middle-class Americans had been losing ground for decades. Democrats needn’t be defensive toward those who are urging them further toward the left. As the Economic Policy Institute (EPI) notes, a great deal of the credit for 2015’s strong report goes to government programs like Social Security, housing subsidies, and unemployment insurance, which together kept millions of people out of poverty. Minimum wage hikes helped boost incomes nationwide. Krugman correctly points out that “progressive policies have worked, and the critics of those policies have been proved wrong.” Democrats need to make that case more forcefully, while calling for new, bold social programs that build on these achievements. In the end it comes down to this: What kind of people do we hope to become? Will we be satisfied with an elegiac future of ever-diminishing aspirations for our children and grandchildren, or will we reach for new goals that rival past achievements like Social Security and Medicare? Democrats need a vision that is compelling enough to rout congressional Republicans, if not this year than in elections to come. They must meet Teddy Roosevelt’s test of leadership by “daring greatly.” Otherwise they’re likely to face a Sisyphean fate, eternally seeking the same compromises over and over again from implacable Republican extremists. They must also resist the temptation to dismiss expressions of concern about the economy as doing Donald Trump’s work for him. That’s ceding the “change” mantle to the Republicans. Democrats can win on a platform of change, because Republicans have nothing to offer but empty rhetoric. It would be a tragic mistake if Democrats presented themselves instead as the stewards and engineers of the status quo, when the status quo has failed so many for so long.